Made with durable nylon canvas and synthetic leather, the Nike SFB Gen 2 8” is a lightweight tactical boot designed for speed and flexibility over rough terrain. Inspired by Nike Free technology, the flexible sole is equipped with an aggressive traction pattern for multi-surface grip and an internal rock shield to help prevent punctures. Synthetic leather and nylon canvas provide durability and breathability. Dual-zone lacing integrates with a durable webbing system for enhanced stability and a locked-in fit. Metal screen vents on the medial side help keep your foot cool. Reinforced stitch and rubber at the toe add durability. Foam midsole gives you lightweight cushioning. Internal rock shield helps prevent punctures and reduce pressure. Rubber outsole with reinforced heel strike zone offers durable traction on a variety of surfaces. Shallow flex grooves are anatomically placed to let your foot move naturally while preventing debris from sticking. Sawtooth design at the arch provides additional grip. The SFB collection honors Nike co-founder Bill Bowerman and his WWII service. Upon his return, he became the head track and field coach at his alma mater, the University of Oregon, where he began creating high-performance footwear for his athletes. Just like Bowerman, everything in the SFB collection is field-proven and dedicated to athletes. I wear 9.5 in Nike SB’s and freeruns. I wear a 10 in this boot. Consider sizing up. Comfortable like sneakers, and wear out like sneakers. Had these for a week now, and use them for field work (Geotechnical engineering inspection); essentially I walk around in dirt all day. Little chips in the rubber and scuffs on the suede already. 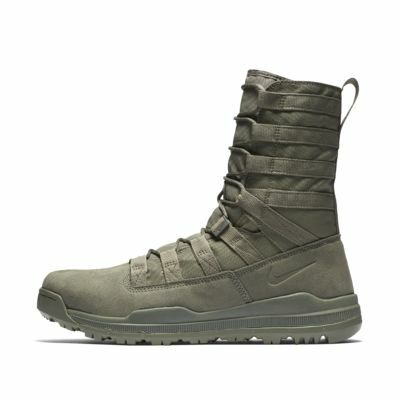 Still, I like them and will probably be buying the Gore-Tex version and using these for for hiking/playing around boots. Not suggested for work use. I’m a lifelong Nike wearer and had great success with the Gen 1 boots. This was the first gen 2 boot I tried. It was terrible. Before I broke the boot in the sole was pulling away from the shoe around the toe, instep and outer foot. I quickly had co-workers pointing at my feet making fun of my “cheap shoes”. I’m searching for a new boot for patrol. I hope Nike sorts this out. I can’t buy these again and don’t want to wear other brands. Just perfect with GORE-TEX for everyday outside use regardless of weather! Best boot so far for law enforcement patrol. I’ve tried original swat, and other brands but feel in love with these. Super lightweight, comfortable, style, easy on and off! (No zipper but the laces have this retention that loosens the top laces only! Anyway NIKE needs to bring back GORE-TEX which makes them pretty much waterproof! I tested them out and never had my feet wet in rain nor snow! If you can GORE-TEX 5 out 5 stars. They temporally don’t have them boot still great boots. Purchase SFB gen 2 8” GORE-TEX June 2018 in all black. PS. Durability is awesome! No complaints, seeking a second pair due to my original ones being confiscated lol (long story)! Nike deeply appreciates all military men and women for their service. Eligible personnel receive a 10% discount on Nike.com orders. Learn more.